The story of the Ioway related by the 1837 map is one of journeys through the midsection of the North American continent. But it's also a story of the Ioway's ability to adapt to changing circumstances. The Ioway homeland at Green Bay on Lake Michigan was thickly forested. At Blood Run, where they shared a home with the Omaha 130 years later, the ecosystem was dominated by mixed-grass prairie. As the Ioways settled in different parts of Iowa, they adjusted to the various environments, modifying their farming, hunting, and housing patterns to suit different kinds of weather and vegetation. 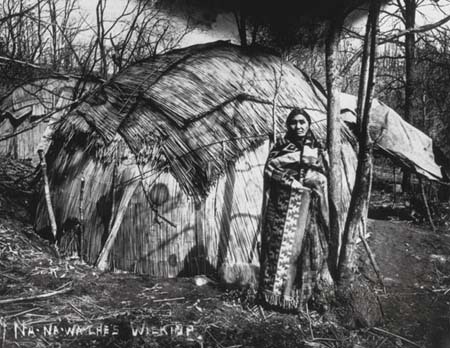 In the 1920s, ethnologist Alanson Skinner visited the Ioways in Oklahoma and recorded five different house types, evidence of their long history of adaptation. Winter houses of the Ioway were oval or elongated ovals, and instead of bark alone, were covered in mats of woven cattail reeds. These houses were 14 to 20 feet long and 10 feet broad, with benches along the side and the fireplace in the center. Construction was similar to bark houses, but they were covered with bark or cattail flag mats, and Skinner believed that they represented the winter version of the square bark houses. One adaptation to weather was to have different homes in the summer and winter. In the 1920s, Ioway summer homes were covered with bark, while cattails provided a warmer insulation for winters. Bark-covered summer houses were rectangular, between about 30-40 feet long by 20 feet broad. They were tall, 14 feet high along the center ridge, and they typically had two doors, one each at the eastern and western ends. A bench about 8 feet wide was placed along each of the sides with a passageway down the center. The fireplace was in the center. The bark covering was generally walnut or elm, peeled in the spring and seasoned by stacking them in a six-foot-tall pile for two years. Then, two forked poles were erected and a ridge pole placed across the tops. A rectangle of four shorter poles formed the sides, and other poles were laid atop these, blocking out the edges of the roof. Other poles were tied sloping up to the ridge; these were notched to provide places to tie on the bark roofing. The sides were also covered with bark. The fireplace was in the center of the home, with a smoke hole cut into the center of the ridge pole. Small slabs of bark placed into position with long poles regulated drafts or closed the roof when it rained. Less permanent and labor-intensive structures were built of wattle and daub. The typical wattle and daub house was rectangular, measuring 30-40 feet long by 20 broad. The walls were made of split 'shakes' of wood about 10 feet high and set up some three inches apart. Each shake was only 4 or 5 inches across; and cracks between the shakes were caulked or chinked with hay and clay (called daub). The roof, slightly arched, was covered with sods. When traveling, or on buffalo hunts, the Ioway used buffalo hide tipis. 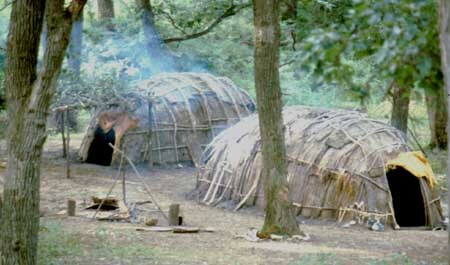 These were conical tents covered in buffalo hide. A four-pole foundation was erected, and up to 20 others filled out the circle. Two more poles fit into sockets to form the entrance. Roughly ten buffalo hides covered each tipi. Peterson, Cynthia L and Joe Alan Artz. 2006. Phase IA Archaeological Reconnaissance Archaeological Context Development, and Geoarchaeological Assessment of the Proposed South Ottumwa Phase I Sewer Separation Project, City of Ottumwa, Wapello County, Iowa. Contract Completion Report 1366. Office of the State Archaeologist, The University of Iowa, Iowa City.